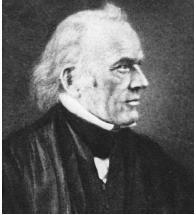 Joseph Story served as associate justice of the U.S. Supreme Court from 1811 to 1845. One of the towering figures in U.S. Legal History, Story shaped U.S. law both as a judge and as the author of a series of legal treatises. Some legal commentators believe Story's treatises were as influential in the development of nineteenth-century U.S. law as the works of the English jurists Sir William Blackstone and Sir Edward Coke had been earlier. Story was born on September 18, 1779, in Marblehead, Massachusetts. He graduated from Harvard University in 1798 and read the law with Samuel Sewall. He established a practice in Salem, Massachusetts, in 1801 and quickly developed an impressive professional career, becoming a director and eventually the president of the Merchant's Bank of Salem. He became a member of the Democratic Party and was elected to the state legislature in 1805. He served part of a term in the U.S. House of Representatives from 1808 to 1809 and then returned to the state legislature in 1810. The following year he was elected speaker of the house. In November 1811 President James Madison appointed Story, at the age of only thirty-two, to the U.S. Supreme Court. Madison hoped that Story would help move the Court in a more democratic direction, correcting the aristocratic tendencies of the federal bench, which had been dominated by the Federalists. In particular, Madison sought to check the influence of Chief Justice John Marshall, whose nationalist philosophy led him to construe federal powers broadly. Thomas Jefferson was opposed to the appointment, however, believing that Story did not subscribe to the Democratic party belief in according deference to state governments. Jefferson proved to be correct as Story quickly revealed an inclination to accept most of Marshall's principles. In martin v. hunter's lessee, 14 U.S. 304, 4 L. Ed. 97 (1816), the U.S. Supreme Court reviewed a decision by the Virginia Supreme Court declaring a section of the federal Judiciary Act of 1789 unconstitutional. In his majority opinion, Story reversed the state supreme court and affirmed the Supreme Court's power to review the highest state courts in all civil cases involving the federal Constitution, statutes, and treaties. This decision was a key component of federal judicial power and antithetical to Jefferson's conception of state-federal relations. "[The law] is a jealous mistress and requires a long and constant courtship. Itis not to be won by trifling favors, but by lavish homage." In trustees of dartmouth college v. woodward, 17 U.S. 518, 4 L. Ed. 629 (1819), Story joined in Chief Justice Marshall's holding that the grant of a corporate charter was a contract with the state. As the state had not reserved a power of amendment, the charter grantees were immune from destructive state interference. Story noted that this corporate Immunity should be extended only to private, not public, corporations. In making this distinction, Story articulated for the first time that the public character of a corporation turned not on the services it performed but on the identity of the contributors of its capital. Thus, a corporation that was chartered to serve the public, such as a bank, would be considered a private corporation if it was owned by private individuals, and its charter could not be withdrawn or amended in the absence of a legislative reservation at the time of the original grant. This definition of private corporations by reference to their capitalization was critical to corporate development in the nineteenth century. Story's most controversial decision came in prigg v. pennsylvania, 41 U.S. 539, 10 L. Ed. 1060 (1842), which involved the federal fugitive slave act of 1793. Many northern states demonstrated their hostility to Slavery by enacting laws designed to frustrate southern slave owners who came north in search of runaway slaves. Slave owners were outraged at these laws and argued that the federal act gave them the right to reclaim their property without interference by state governments. Story, writing for an 8–1 majority, declared unconstitutional all fugitive slave laws enacted by the states because the federal law provided the exclusive remedy for the return of runaway slaves. Story also ruled, however, that states were not compelled to enforce the federal fugitive slave provisions. It would be inconsistent and without legal basis, he reasoned, for the Court to declare the preeminence of federal law and then require state courts to help carry out that law. Prigg was a crucial decision because it announced that slavery was a national issue that could not be disturbed by State Action. It angered many opponents of slavery and hurt Story's reputation in the north. Some state judges took Story's opinion to heart and refused to participate in federal fugitive slave proceedings. Story's other major contribution on the Court was the development of "federal common law," which was first articulated in the 1842 Civil Procedure case of swift v. tyson, 41 U.S. 1, 10 L. Ed. 865. The controversy arose on a technical question involving the negotiability of a commercial bill of exchange. New York and other states were divided over whether the bill was negotiable. Under the federal Judiciary Act of 1789, the federal courts were instructed to follow state laws when deciding cases between parties from two different states. Story, who believed the negotiability of such bills was crucial to the development of a national commercial community, declared that the decisions of the New York courts—based not on legislative statutes but on interpretations of the common law—were not "laws" binding on federal judges. Common-law decisions were only "evidence" of the appropriate law. Story concluded that it was the duty of federal courts to examine evidence from all relevant state common-law jurisdictions before proclaiming the governing rule. Story's opinion came to stand for the proposition that a general federal Common Law existed that federal courts were free to apply in virtually all common-law matters of private law. The idea of federal common law promoted national uniformity but also constituted a revolutionary expansion of federal jurisdiction. The Supreme Court overruled this proposition in erie railroad co. v. tompkins, 304 U.S. 64, 58 S. Ct. 817, 82 L. Ed. 1188 (1938), declaring that federal courts must apply the law of the state, whether it is statutory or case law. Story's influence went beyond his court decisions. In 1829 he was appointed to be the first Dane Professor of Law at Harvard. He remained in this position the rest of his life while simultaneously serving on the Supreme Court and acting as president of the Salem bank. The endowment that Nathan Dane had given to Harvard Law School also paid for the publication of Story's many legal commentaries and treatises, which summarized and codified various areas of the law. Story's works included Bailments (1832), Bills of Exchange (1843), Conflict of Laws (1834), Equity Jurisprudence (1836), Equity Pleading (1838), Federal Constitution (1833), and Promissory Notes (1845). They served as valuable reference works for lawyers, judges, and legislators and had a profound influence on the development of Commercial Law in particular. Alexis de Tocqueville, the French author of Democracy in America (1835–1840), a classic analysis of U.S. society and government, used Story's constitutional commentaries in writing his work. Story died on September 10, 1845, in Cambridge, Massachusetts. Finkelman, Paul. 2002. "Joseph Story and the Problem of Slavery: A New Englander's Nationalist Dilemma." Massachusetts Legal History 8. Story, William W., ed. 2000. Life and Letters of Joseph Story, Associate Justice of the Supreme Court of the United States, and Dane Professor of Law at Harvard University. Union, N.J.: Lawbook Exchange. The three-year-old won his first two starts this season after joining the Nicholls team, and failed by a matter of inches to win the consolation race for the Stewards' Cup at Goodwood behind another Nicholls success story, Joseph Henry. The plot in this story, Joseph tells his brothers about his dreams, which belittles them, so they plot to sell him to a hairy bunch of Ishmaelites. Singers will also need to prepare a song from any musical, such as Grease, Fame, West Side Story, Joseph, or The Sound of Music, and perform it in front of the audition panel.